Posted on August 19, 2011 by Akashic Love & Light! 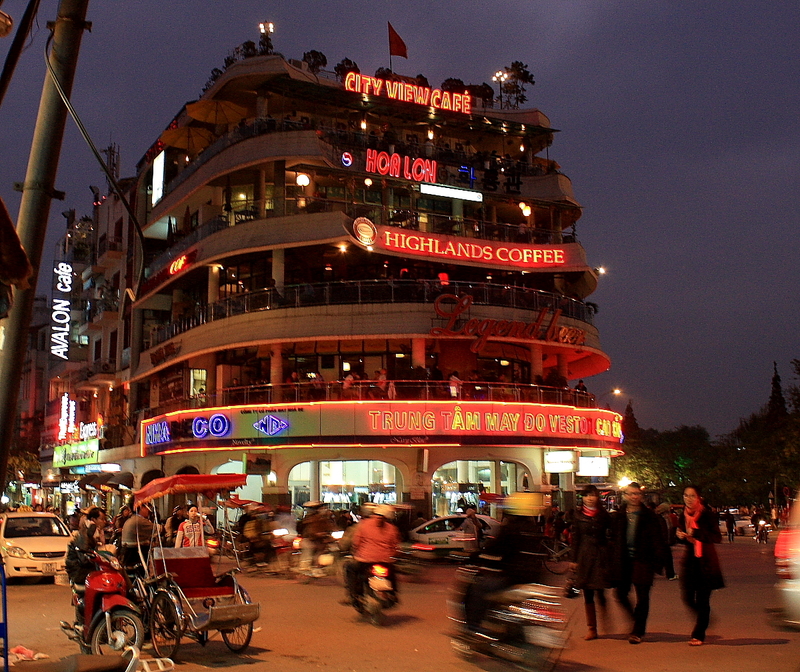 Hanoi is a vibrant city with an intense energy that captivates its visitors, sweeping them up in a whirlwind of chaos and excitement. Equipped with a crumpled up map of a walking tour I copied from Frommers online, I felt confident I could navigate the winding maze-like streets of the Old Quarter of Hanoi to find the Dong Xuan Market. 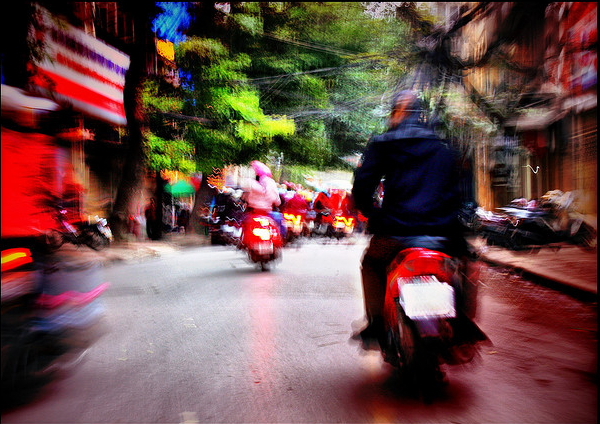 But as soon as I stepped out of the hotel onto the main street the buzz of a hundred scooters whizzing through the streets made my head spin. Weaving through a wall of brightly colored scooters we crossed the road carefully but quickly in a frogger-like fashion. They don’t believe in traffic lights I told my friend as we somehow made it safely to the other side. The flower festival was going on and according to the map we had to head straight through it to get to the market. Although I am not sure I understood what was going on it was quite the occasion! 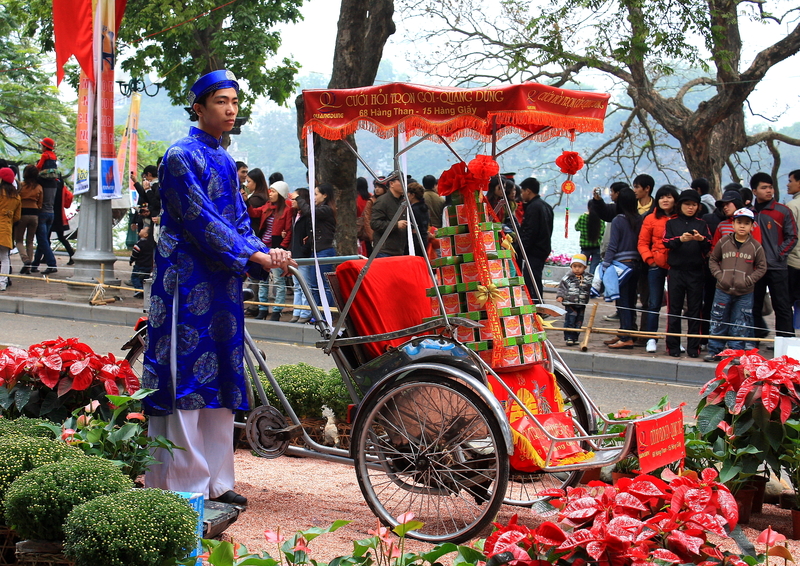 Throngs of people crowded the streets and carts overflowing with bright yellow, pink and purple flowers lined the thoroughfares along the reflective Hoan Kim Lake. Uniformed guards dressed in conservative green and gold uniforms stood stoically along carefully measured points along the sidewalk keeping the peace. After wandering around the lake for a bit we decided to focus back on our original goal; the market. 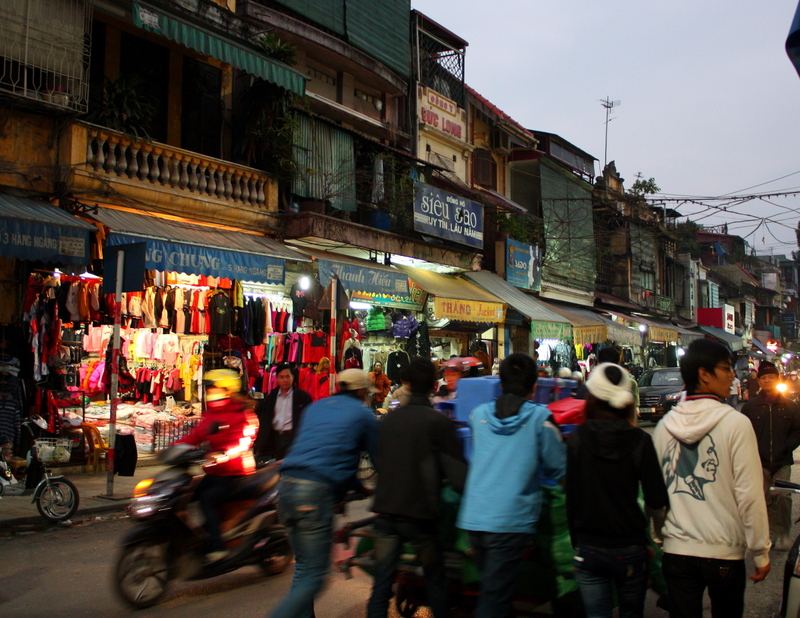 We were on our way to Dong Xuan Market; the largest covered market in Hanoi filled with mass quantities of clothes, trinkets, vegetables, and household goods. What I didn’t realize was that to get to the market we would have to navigate through the 36 streets of the Old Quarter of Hanoi. Coined 36 streets because each street is named after the item they sell; a tradition carried over from Hanoi’s distant past when guilds made up the quarter. The term 36 streets is a little misleading because the area actually consists of a tangled web of 70 plus streets. Each street begins with the word hang, which means store or shop. 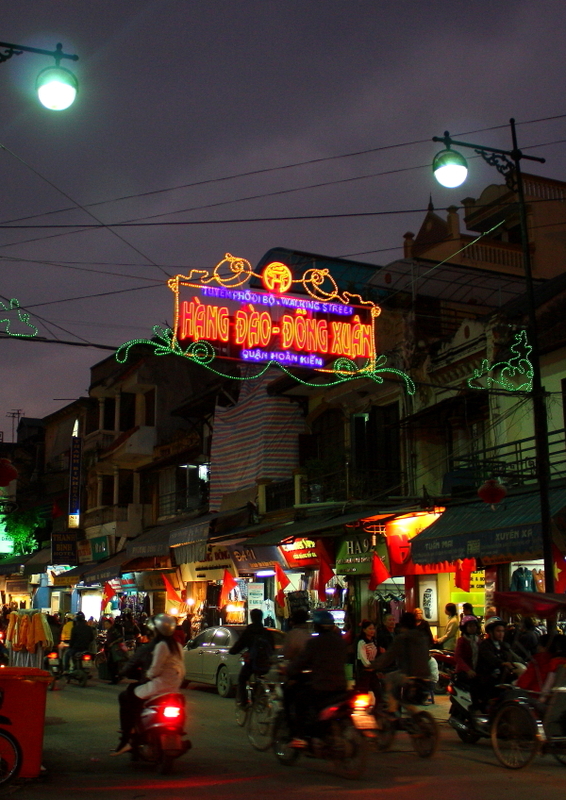 For example, Hang Dao is an entire street that sells silk products, and Hang Ma street sells paper products like decorations and paper lanterns, Hang Mam sells fish and fish products like sauces and dried goods. There is one whole street Hang Gai dedicated to selling just hemp and rope. Its overwhelming to see an entire street with every single shop selling one item! Crossing through the maze of Hang streets is not as easy as the map made it look. It was hard to focus on the map without getting sidetracked. I was in sensory overload- bordering on culture shock. 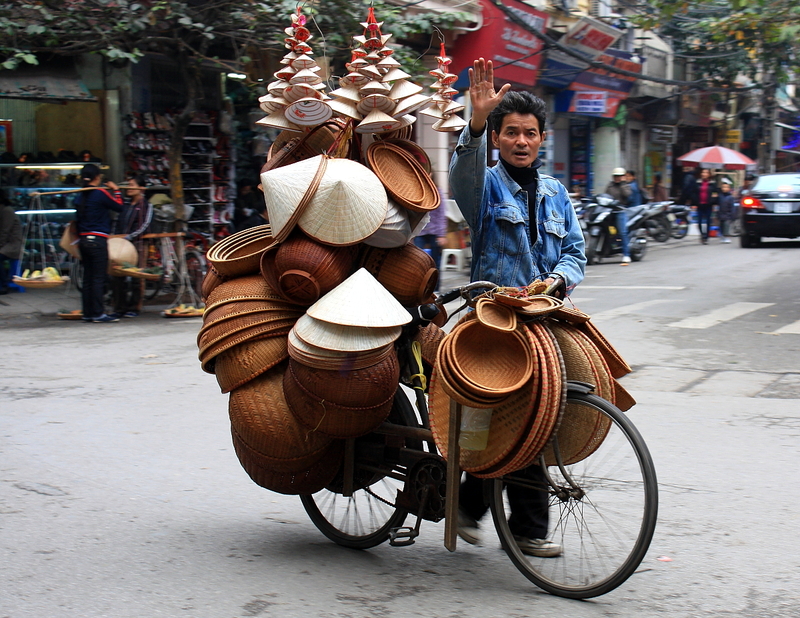 A bicycle sped by carrying a multitude of straw brooms in all shapes and sizes. An older Vietnamese women zoomed up out of nowhere selling little doughnuts from a black box attached to the back of her bike. Crowded restaurants sit on every corner, their mini blue or red plastic tables filled with hungry people eating Pho; a traditional type of Vietnamese noodle soup. We wandered into a covered market filled with rows of tables, big plastic buckets overflowed with live eels, fresh fish, shrimps and even worms. The intense odor of briny fish, the whirl and fumes of the motor scooters, the constant chatter of a million voices, and the chaos of throngs of people will inevitably overload even the calmest person. I felt irritated, agitated and excited all at once. Culture shock! I decided to give in to the madness and ditch the map, all the Hang’s were starting to look alike anyway. Finally, after hours of wandering around looking through shop after shop we found Dong Xuan Market. What looked like a short distance on the map turned into an all day excursion. 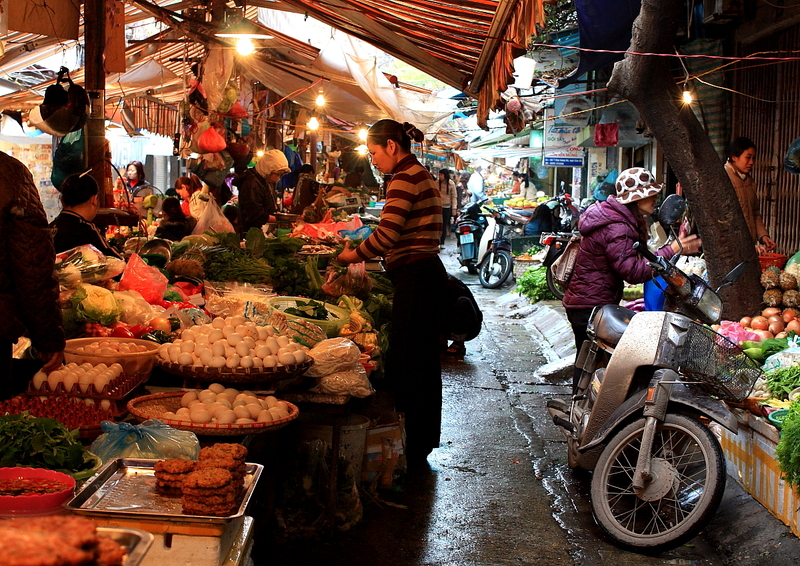 Located on the corner of Dong Xuan and Hang Chieu streets, this bustling market houses about 50 businesses selling everything from food and appliances to clothing and shoes. By now we were both getting tired and hungry so we headed back to the Hoan Kim Lake area. Tired of shopping at this point we intuitively made it back to Hoan Kim Lake rather quickly. Before attempting to cross the crowded festival again, we stopped at Highlands Coffee in the five-story building overlooking the lake. Standing out on the balcony, I was mesmerized by the sheer number and movement of people below. Even from high above I felt energized and excited. 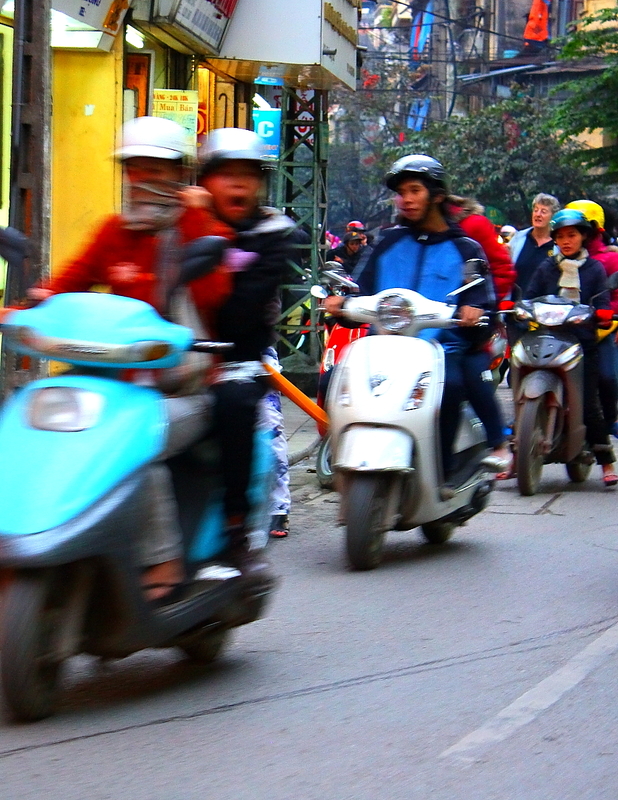 Hanoi has an infectious energy, the chaos of the crowds, the noise of the scooters, its hard not to get swept away in its chaotic whirlwind. My advice? Ditch the map and get lost in the maze of winding streets and shops of the Old Quarter. 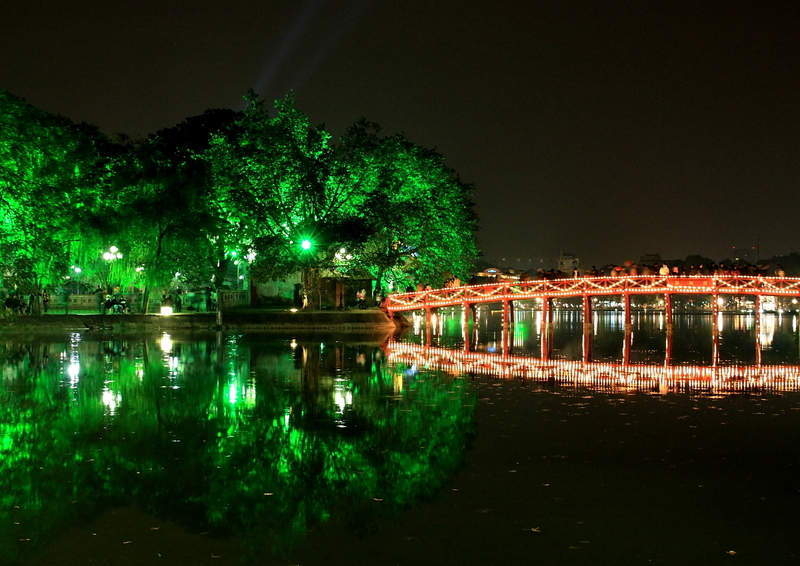 Grab a coffee and stroll around the beautiful Hoan Kim Lake. This entry was posted in asia and tagged asia, Dong Xuan, Dong Xuan Market, Frommer's, Hang Dao, hanoi, Hanoi's Old Quarter, Highlands Coffee, hoan kim lake, old quarter, Scooter (motorcycle), southeast Asia, vietnam, Vietnamese noodles. Bookmark the permalink. Thanks for adding my blog to your reference list Christine. Love reading your travel adventures!